The big message for the Tories as we go into the last two months and a bit is that they need to have emphatic leads across a range of pollsters to be certain of coming top on seats. Unlike previous elections when you could compute these things relatively easily today it is so much hard to state anything with any certainty. The current assumption is that LAB will lose 20-30 seats in Scotland but very small movements could push that one way or the other. But this could be a mixed blessing for the blue team. A huge LAB collapse would make the SNP extraordinarily powerful and present huge problems for the the Tories – if indeed they remain in power. This is the latest from Electoral Calculus which takes into account a huge move to the SNP yet still leaves LAB a lot closer to majority territory. The next PB get-together will take place on Tuesday March 17th from 7pm at the Shooting Star in Middlesex Street. As the map below shows this is just round the corner from our normal venue, Dirty Dicks. We are hoping that this will be less crowded and noisy than the pre-Christmas bash. Thanks to Fat Steve for finding the new venue. There are also plans for overnight May 7/8 – details soon. Elections are won on perceptions as much as realities: competence, trustworthiness, whether a person or party is ‘on my side’, and so on. It’s therefore brave of Labour to propose funding a cut in university tuition fees from taxes raised on pensions. In doing so, the unintended consequence of opening up a policy front on what ought to be a relatively strong policy subject for them may be to divert it instead to a much weaker one. 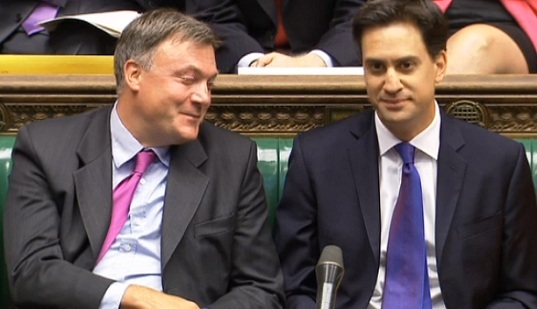 Labour’s record in government on pensions was not a happy one. Part of this was accident – longer life expectancy and lower yield rates were largely generational or global events – but part was not: Gordon Brown’s raid on pension funds in his first two Budgets. That act did not of itself kill off final salary pensions but it did accelerate the trend. As a result of the declining returns, many middle-class voters have lost out. For Labour to revisit pensions as a tax source invites comparisons with 1997/8, particularly given Ed Balls’ positions then and now, and also given the propensity of the Middle class and middle aged to vote. Where the Tories and Lib Dems can attack – beyond basic economic trustworthiness – is on the reduction in the size of an individual’s maximum overall tax-free fund to Â£1m. Obviously it would be a mistake to go on that specific: Â£1m sounds like a lot to ordinary people and the technicalities of having to explain why it’s not will turn most voters off. In fact, it would affect many workers on comfortable but not massive incomes such as many public sector workers paying higher rate tax. “Does Labour plan to raid your pension again?” could be a potent slogan. For the time being, it doesn’t matter; there’s enough mileage for the government in the fees story itself what with richer former students benefitting most from Miliband’s message. Labour may dispute that and will in any case be keen to remind voters of the Lib Dems’ perfidy on the subject, though it may be optimistic of Labour to expect an exemption from the voters in respect of politicians’ pledges when so many voters see the main parties as ‘all the same’. What’s also worth asking is whether the fees policy will actually change votes. We know a huge number of voters switched from Lib Dem to Lab in 2010 and we also know that virtually none have gone back, so who is the policy aimed at? Not those who’ve gone on to UKIP presumably given the small numbers there in the 18-25 age group. likewise, not those who’ve gone SNP given the different arrangements in Scotland. Lab-Green switchers is possible but trying to outflank the Greens on tax and spend is like the Tories trying to outflank UKIP on immigration (though perhaps not the best time to mention that topic). Which is why the unintended consequences of the policy could be far more significant than the effects of the proposal itself. There’s little doubt that one of the great successes that UKIP has had has been in engaging within the political process those who have never, or not recently, used their vote. The above breakdown is from the latest Survation South Thanet poll illustrates this well. Because of the way the firm presents its data we are able to quantify the non-voting element. A big question with non-2010 voting support is whether their backing can be relied on as much as those who do generally turnout for elections. My reading of the data is that UKIP are ahead but not be the 11% margin that the headline figures pointed to. Did old-Etonian Jesse Norman cost his party the election? On July 11th 2012 David Cameron was seen to be having a furious row with his fellow old-Etonian, Jesse Norman, who had just led the successful backbench revolt against planned House of Lords reform. Cameron knew very clearly what this meant. The boundary changes, which it was calculated would give the Tories an extra 20 seats over Labour, were almost certainly not going to go through. Not so long afterwards Nick Clegg confirmed that his party would not vote for the final implementation of the plan thus scuppering something on which the Tories had been placing a lot of hope. It had been blindingly obvious that undermining this reform would lead to this outcome yet Mr. Norman had pressed ahead and membership of the upper house continues to be by preferment – as Mr Straw reminded us on TV on Monday night. Just think how in the current tight political situation what those 20 extra MPs would do to the Tory position? Time appears to be running out for SLAB and Jim Murphy to avoid a shellacking in May. TNS’ second poll this year, brings them into line with all the others bar Panelbase who have substantial leads for the SNP. Which are two issues already devolved to Scotland. “68% said healthcare/the NHS was â€œvery importantâ€ in their voting decision, while 50% cited education/schools.Â Both SNP and Labour voters regarded health as being very important issues, mentioned by 72% and 75% respectively. However, SNP voters were more likely to cite education as an important issue than Labour voters â€“ 57% compared to 46%. The fieldwork sawÂ 1,001 adults aged 18+ interviewed from the 30thJanuary to 22nd February 2015. It was Tim Montgomerie in today’s Times who alerted me to the forecast for Farage’s South Thanet that has been produced by the 2015 UK Parliamentary Election Forecast – a collaberation between dons at UEA, LSE and Durham. For anyone betting on single seats their site is a gem with percentage probabilities for each party in every single seat. Except that some of the forecasts just don’t feel right given everything that we know. The Farage battle is a case in point. That was before Christmas and things have moved on – notably a decline in UKIP poll shares generally. My view of the seat is as recorded in previous posts. I think Farage has got a battle on his hands and both Labour and the Tories will do everything to generate anti-UKIP tactical voting to their candidates. This is a very tight three way marginal. My money’s on both the Tories and LAB because of the odds I got – but, realistically, this is a gamble that I won’t be too upset about if I lose.